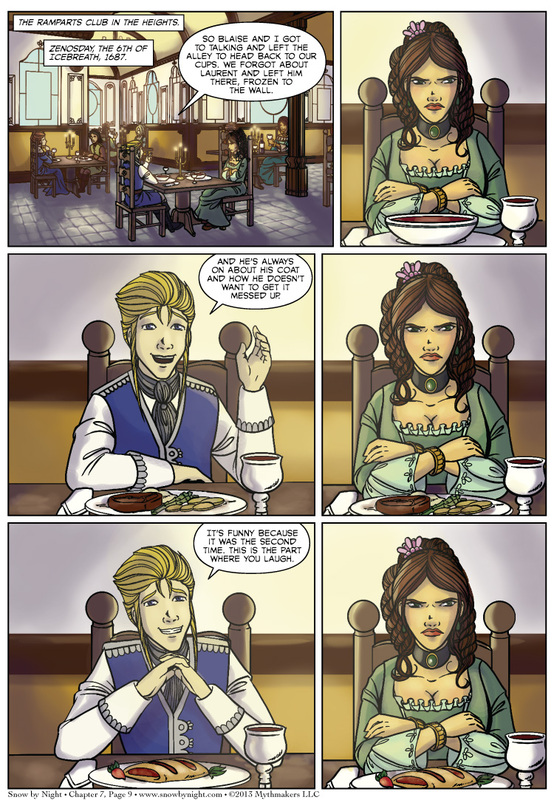 Awkward dinner time with Jassart and Mathilde on Chapter 7 Page 9. Mathilde glowers so well. 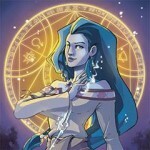 To see a preview of the next page, please vote for Snow by Night on Top Web Comics. Otakon is this weekend! 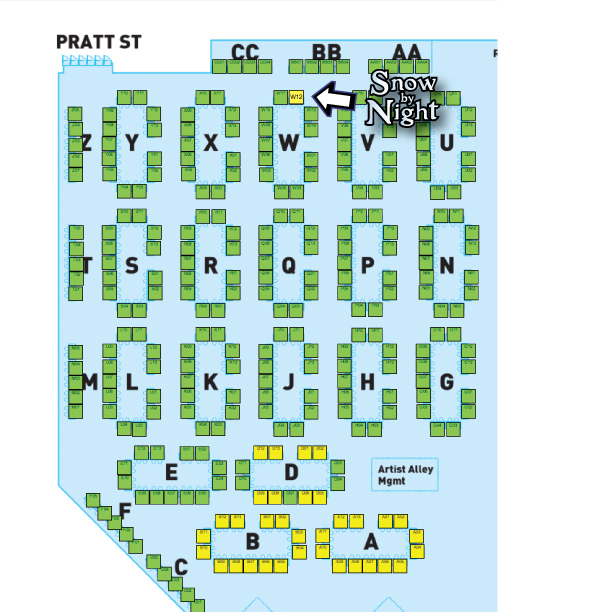 We’ll be in the Artist Alley at table W-12. We’re right next to Julie Wright of Ianua. She’s got new books so be sure to stop by and see her too. You are not winning friends and influencing people there Jassart! Jassart needs to learn the three little words vital for a happy relationship: ‘I was wrong’. The food. It changes. Seriously doesn’t anyone notice when the food is changing? I admit I hadn’t noticed, but now that you pointed it it out, I do! I’ll take a guess that the food’s changing because they’re three different courses (soup course, main course, and dessert). Jassart has been attempting conversation the entire time, and we’re seeing snatches of his attempts. I’d even go so far as to say you could show an arm serving the dessert plate or something, so that you notice that there is an extra course happening there. Brittany’s already finished drawing this entire scene and we don’t have time to go back and redo the tableware, which doesn’t have a major impact on the overall story. I can add in text boxes pretty easy. I’ll see what I can do after Otakon. I noticed the food too. And after staring at it for a while I realized why it was bothering me. The artist drew the place settings as if they were sitting in front of the artist rather than as if they were sitting in front of the characters. So, they ought to be reversed. The wine glass should be to the character’s right, our left. Also, having the arrow keys-as-navigation is kind of irritating when commenting here, since I can’t simply go backwards with the key and edit what I’m typing without having it reload the page and dump my comment. Did that three times so far. Yeah, I only found out about this convention about two weeks ago. Make an ‘o’ by touching your thumb and pointer-finger (do both hands at once). Make your other fingers straight. See how your left hand makes a ‘b’, and your right makes a ‘d’? That’s a reminder that your *b*read plate is to your left, and your *d*rink is to your right. Clearly someone needs to teach that to the waitress at the Ramparts Club who laid the table. Maybe this is what Mathilde is sulking about. She could at least eat the asparagus. It must have cost a fortune in the middle of winter. Dang. At this moment, Mathilde could be a worthy competitor for Snow in wielding ice powers. Methinks the lady is less than pleased.